In our 3-part blog series on how engines really work we’ll get down to the nuts and bolts of what makes your engine rev. First up in our engine master class: engine types and parts. When was the last time you looked under the hood? Getting to know all the engine parts can be tough, even for a rev head, but it’s a great place to start your engine education. Remember a car engine is an internal combustion engine. That is, gasoline combustion takes place internally. There are different types of internal combustion engines. You’ve got your diesel engines and your gas turbine engines. The principle works like this: you put a small amount of fuel into an enclosed space, ignite it, and energy is released in the form of expanding gas. This process takes place on a massive scale – hundreds of times per minute. Used cars can have issues with worn out engine parts, causing problems during any one of the four strokes – but more on that in part 3. Most cars harness this energy using a four-stroke combustion cycle that includes an intake stroke (cylinder fills with air and gasoline), compression stroke (piston compresses air and gasoline), combustion stroke (spark plug produces ignition, explosion occurs, piston forced down) and exhaust stroke (exhaust valve opens). Most new cars for sale in 2013 still operate using this four stroke cycle engine. Now let’s dissect the parts that make this all happen. The cylinder: This is the core of the engine, and contains the vacillating piston mentioned above. Spark plug: Creates a carefully-timed spark which ignites the fuel and gas mixture contained in the cylinder. Valves: There are two valves, one to let air in (to combine with the small amount of gasoline) and one to let exhaust out. 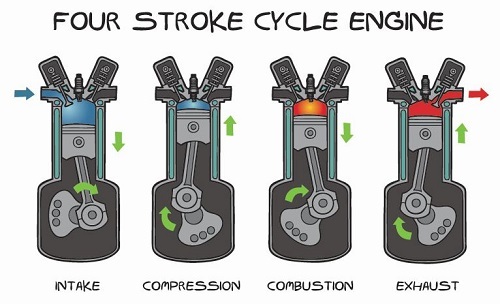 Both valves close during the compression and combustion strokes. Piston: The gas-tight moving component contained within the cylinder. Piston rings: Seal the outer edge of the piston and inner edge of cylinder, preventing fuel leaks. The reason that older cars often burn a lot of fuel is because the piston rings are failing to provide a proper seal. Connecting rod: Connects the piston to the crank or crankshaft. Crankshaft: Together with the connecting rod, the crank turns the pistons vacillating motion into a rotating motion. Sump: Surrounds the crankshaft, lubricated with oil that collects in the bottom of the sump – the oil pan. In the next instalment of our 3-part engine master class we’ll take a closer look at the different subsystems in modern engines. Do you like to get your hands dirty under the hood or leave it to the mechanic?